Big Apple Pizzeria has something for everyone from cheese pizza to our employee specials that include some of our top of the like New York style pizzas. Why not get your family together and come enjoy a mellow evening in Sugar House at the Big Apple Pizzeria, get them together and come in today. Why go to New York to have amazing Pizza when all you have to do is come to Big Apple Pizzeria and try some Sugar House Pizza. Get your family together for a night of fun at Big Apple Pizzeria tonight. All of our ingredients are fresh and you can always expect the best service and quality at Big Apple Pizzeria. 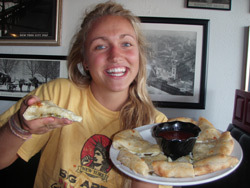 Big Apple Pizzeria has the best pizza and calzones in Utah and has amazing deals all week long. How would you like to try Big Apple Pizzerias meat pepperoni pizza, lovers pizza, or even one of our hot to order calzones or benders. Big Apple pizzeria has the best Sugar House pizza so why waste your time going anywhere else when you have already found the best pizza around. Big Apple Pizzeria has something for everyone from cheese pizza to our employee specials that include some of our top of the like New York style pizzas like the Asparagus Garden Pizza. Why not get your family together and come enjoy a mellow evening in Sugar House at the Big Apple Pizzeria, get them together. Big Apple Pizzeria has the best Sugar House Pizza available so place an order or come try a single slice today.